This year's Caribbean season is just getting underway, but Princess is already looking ahead to next year. The line has just opened their winter 2011-2012 Caribbean program, including a totally new 7-day itinerary. Details were in the November 5, 2010, edition of Cruise News Daily. How was your October? Did you have a good month? Seabourn certainly did. The luxury line took more bookings last month than in any other month in the company's history. Net bookings for October 2010 were 166% more than in October 2009. At the same time, however, there have been large capacity increases, so the line has to be posting large increases to remain healthy. 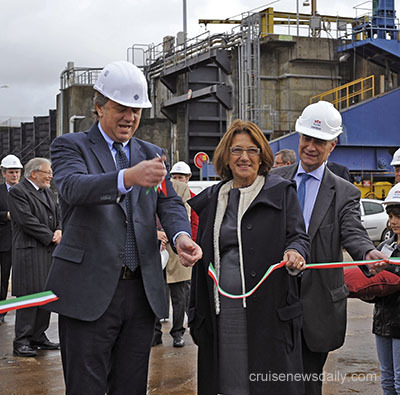 The complete story appeared in the November 5, 2010, edition of Cruise News Daily. CND subscribers also read about an exclusive club that meets aboard Queen Elizabeth ... where passengers are coming from for Oasis & Allure ... steady cruise passenger growth in Baltimore ... sudden shrinkage at Malta ... and latest photos from Allure. Details of these items appeared in the "Other Things You'll Want to Know" column in the November 5, 2010, edition of Cruise News Daily.. Earlier this week we reported the assembly phase had begun for the third of MSC’s Fantasia-class vessels. Today, it became official with the traditional welding of a coin to the ship’s keel in a traditional ceremony. MSC used the ceremony to make a couple of announcements, including a new name for the ship. The ship will now be named MSC Divina, and it will be named in the port of Marseille in May 2012. 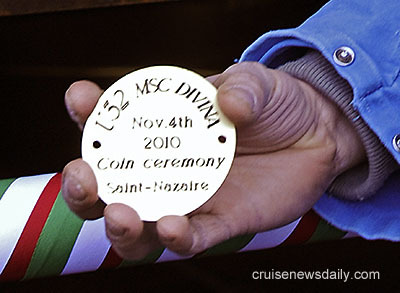 This is the coin that was welded to MSC Divina's keel at the STX Europe shipyard in Saint Nazaire (France). It has the MSC logo on one side, and the coat of arms of the city of Marseille on the other. Shown at the ceremony (left to right) are Mr Pierfrancesco Vago, CEO of MSC Cruises, Ms Dominique Vlasto, Deputy Mayor of Marseilles with responsibility for tourism, and Jacques Hardelay, General Manager of STX France. The complete story appeared in the November 4, 2010, edition of Cruise News Daily. CND subscribers also read about layoffs STX in the wake of Allure's delivery ... what some employees will do for Cunard ... an update on the Delphin, now in trouble again and the Port of Venice coming to the aid of the crew ... why merchants in Nassau are excited about a hurricane ... and "stress testing" the Dreamworks characters on Allure. Details of these items appeared in the "Other Things You'll Want to Know" column in the November 4, 2010, edition of Cruise News Daily. Are you sailing to Southampton this week? A lot of Facebook users are, but they're never leaving their computer screens to do it. Cunard had a fun low-tech idea that's playing out this week on their Facebook page. It seems to be aimed at people who have never crossed the Atlantic on Queen Mary 2, Cunard's signature route, and people who have and want to relive the experience. The complete article appeared in the November 3, 2010, edition of Cruise News Daily. CND subscribers also read about Lisa Bauer's first-hand account of crossing the Atlantic on Allure of the Seas ... St. Lucia recovering from Hurricane Tomas ... and another setback for cruise tourism in Cuba. Details of these items appeared in the "Other Things You'll Want to Know" column in the November 3, 2010, edition of Cruise News Daily. The Mexican Riviera market has been suffering from a combination of too much capacity and the local (drive) market's boredom with ports. Some cruise lines have responded by reducing capacity. Crystal, however, seems to be the only line responding by trying new itineraries out of Southern California. The line replaced two fall 2011 Mexican Riviera sailings with California coastal sailings. The line did the same with two spring 2011 sailings, and those are selling well. The complete article appeared in the November 2, 2010, edition of Cruise News Daily. CND subscribers also read about Princess' latest essential experience ... assembly of MSC's next ship beginning at the STX yard in Saint Nazaire ... cruise lines being placed in a dubious group by the State of California ... another medevac from Carnival Splendor ... and a random search pays off for US Customs and Border Protection. You wouldn't think it's possible, but the Yacht Club aboard MSC Fantasia and MSC Splendida just got more exclusive. The Yacht Club is the "ship within a ship" for passengers booking suites on MSC's two 133,500-ton vessels. The complete article appeared in the November 1, 2010, edition of Cruise News Daily. Yesterday, with just inches to spare, Royal Caribbean's newest ship, Allure of the Seas passed under Denmark's Storebaelt Bridge (Great Belt Bridge) on its way from the shipyard in Finland to its new home port in Ft. Lauderdale. The video below shows the retractable stack being lowered, an aerial view of the passage, and some close up views going under the bridge.